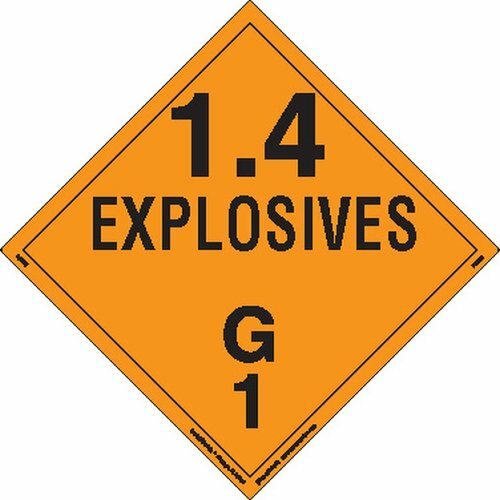 Play it safe when shipping explosive substances with Labelmaster's Explosive Class 1.4 G Placards. These display the Division Number, which is the classification code for an explosive, and the Compatibility Group Letter, which conforms to the UN System. The letter G is used to specify controls for the transportation and storage of Hazard Class 1 explosives and to prevent an increase in hazards that might result if certain types of explosives were stored or transported together. These placards are designed to meet all 49 CFR DOT Placard specifications as well as the requirements of the UN System. They are made of highly durable, removable vinyl and feature weather-resistant adhesive backing that permits easy application and easy removal with little or no residue. Orange and black, the placards measure 273 x 273mm, can be used in Slidemaster holders and are sold in packs of 25 or cases of 900.